Many gardeners understand the heartbreak of finding their prized plants nibbled to the ground or denuded of flowers by browsing deer. Gardeners use many strategies to control deer in the garden; the most effective strategy is selecting plants that deer don't like. 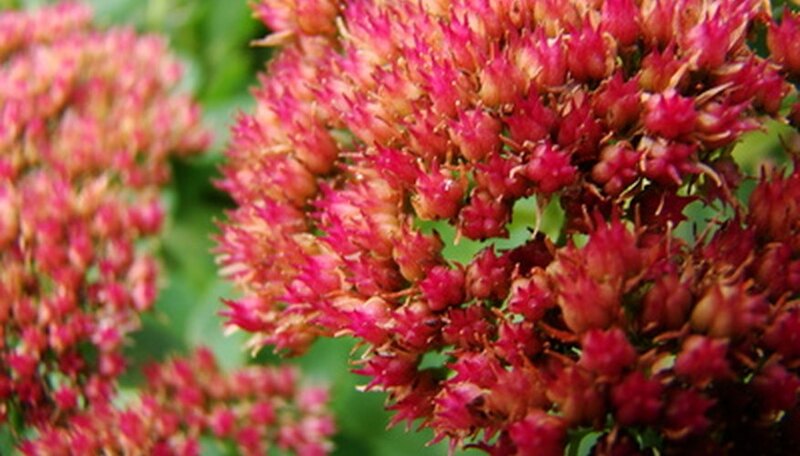 Sedum Autumn Joy is a versatile perennial flower that many gardeners find deer-resistant. Sedum Autumn Joy is a variety of the succulent Sedum genus and grows in USDA Zones 3 through 11. It has thick, fleshy leaves and forms a bushy mound 12 to 36 inches tall and wide. In summer, it is topped by tight clusters of pink, star-shaped flowers. Throughout the summer, Autumn Joy's flowers progressively turn dark pink, then coppery red in fall. Sedum Autumn Joy is generally resistant to deer because of its bitter taste and sticky texture. Some gardeners, however, find that deer eat their Autumn Joy anyway. While deer definitely have food preferences, if food is scarce and deer are very hungry, they will eat almost any plant they can reach. Neighbors who have Autumn Joy in their yards are good resources for determining the resistance of this plant. If your Sedum Autumn Joy has been damaged by deer, move it closer to the house where deer will be warned off by human activity and scent. Don't plant susceptible plants near known deer paths, which are usually on the periphery of most properties. If your yard has a fenced area, plant Autumn Joy inside the fence. If you are concerned about deer eating your Autumn Joy, plant it near other deer-resistant plants such as highly fragrant herbal perennials like rosemary or lavender. Black-eyed Susans and purple coneflowers are complementary options, while prickly mahonias and smelly boxwoods reduce its susceptibility to deer. In the unlikely scenario that deer are ravenous for your Autumn Joy, you can use a deer repellent product available at garden centers. Most repellents contain the urine of natural predators like bobcat or coyote to ward off deer. Some do-it-yourself diehards use human urine at the base of plants to keep deer away. Many gardeners find that deodorant soap hung from branches in old stockings keeps deer at bay as well. Do Deer Eat Zinnias or Gerber Daisies?